So there we have it. Mercedes proved that Singapore was a mere blip in their rampant charge towards the constructors and drivers title as Lewis Hamilton took a dominant victory in Japan. Nico Rosberg is running out of races to keep his world title hopes alive, and will need to push harder than ever. His next chance to do just that is in Russia a fortnight. See you then. If you did indeed opt for a lie in and fancy seeing the race in full, then it will be replayed on BBC One and online at 13:15 BST. Extended highlights will then be on BBC Three at 19:00. Formula 1 is back in two weeks with the Russian Grand Prix, which is live across the BBC. Just woken up? Missed the race? Here's a quick summary of how it went. Heather Williams: Really pleased with the news from Ron Dennis. Dale Xanders: Very deflated interview from Button. Such a shame. Feel so sorry for him. Pure frustration. Him and Alonso. Jen: Race was good but the #bbcf1 interview with Ron Dennis was interesting and honest. Stay JB! One final look at the drivers' championship and Lewis Hamilton extends his advantage to 48 points, Sebastian Vettel is a further 59 points back in third. The only movement inside the top 10 is Romain Grosjean up to ninth after finishing seventh, with Sergio Perez 10th. Almost time for us to wrap things up but a mention for the Toro Rosso pair Max Verstappen and Carlos Sainz. Great work once again, especially Verstappen as he swept through the field with a number of stunning overtakes. Did I mention he turns 18 on Wednesday? He has scored for the fourth time in the last five races while Carlos Sainz is now the top scoring Spaniard in the championship, having beaten Fernando Alonso to the final point. After starting seventh, Daniel Ricciardo finished 15th following an early tangle with Felipe Massa that resulted in punctures for both of them. "As soon as the lights went out I thought 'ok this is four good starts in a row'," He said. "But then I could see the gap was closing and if you lift, you lose. All the good work is undone. I thought the gap was big enough. In the end we touched. A shame as both our races were more or less ended by that." Good insight from David Coulthard about what it is like being a racing driver and not winning world championships. "I don't lose any sleep about not winning a world championship," he said. "I got beaten by better people. Simple as that. "I would never have wanted to win the championship in a weak season. Take away Mika Hakkinen and Michael Schumacher, I probably would have won the championship, would it make me a better racer standing here today? No it wouldn't." Quote Message: Nico is in the best team and car combination right now. There are still races to go. Nico did nothing wrong with his approach to the weekend. If you look at the history of the sport there are guys that seem to get some of the racing luck and some that don't. He is so close to being brilliant. He can unlock that, but he just has not found that yet. Nico is in the best team and car combination right now. There are still races to go. Nico did nothing wrong with his approach to the weekend. If you look at the history of the sport there are guys that seem to get some of the racing luck and some that don't. He is so close to being brilliant. He can unlock that, but he just has not found that yet. Mercedes' Nico Rosberg chooses his words carefully when he's asked by BBC Sport's Lee McKenzie if Lewis Hamilton's overtake of him was fair. He said: "It's difficult to judge because I don't know if he was on his ideal line or not - I just see his front wheel next to me and that was enough to tell me to back out. "Everything needs to be perfect to beat Lewis at the moment but this weekend there were two small things. "I am pleased I made it all the way back to second." Quote Message: If you have your nose ahead you take the line. That leaves the guy behind with a choice to either stay there, and you will make contact, or you back out of it and Nico does that. If you have your nose ahead you take the line. That leaves the guy behind with a choice to either stay there, and you will make contact, or you back out of it and Nico does that. Lewis Hamilton has just talked about his start with Suzi Perry and David Coulthard. "I knew that it was my right of way," he said. "Once I got my car slightly ahead I knew that it was my right of way. I was ahead here [in the picture above], so that is my road. I don't particularly think it was too close." Asked by David Coulthard if he ever feels sorry for Rosberg about coming second best in wheel-to-wheel racing, Hamilton added: "Rosberg was fair. He drivers incredibly well and has done a great job this year. This is racing and that is what it is all about. There have been times when I have fallen behind. It happens." Sara Turle: Do you feel you got the true picture from Ron Dennis? Great relentless questionning! Emma Sheridan: Is it about time we bring back Ross Brawn and make him team leader of McLaren? Rian Hoskins: If Button is to stay at McLaren, will it be with a view to retire at the end of 2016 and allow Magnussen or Vandoorne to take over? Dale Buckley: Ron mentioned restrictions are increasing costs, so how else can costs be reduced if teams are going to spend in other areas anyway? "We are going up a steep learning curve. It's steeper than expected but there is no other way of winning a world championship. "You see Red Bull in pain at the moment and are going to see a lot of pain down the pit lane." The quotes keep on coming from that earlier Ron Dennis interview. ere's a bit more. Dennis admits he "can't think of a lower point" during his time in charge at McLaren but says "they haven't forgotten how to win" and will get back to the front. "We are constrained by what you can do in the wind tunnel and what you can do with the engine," he said. "If you don't get it right in the beginning, it's very difficult to climb out of a hole. "If you are not able to develop the car, you are not going to be able to catch up unless you are very inventive and that's what we've got to be. "It is a painful experience. We are just going to focus on getting the job done with our partners, Honda. We want to catch up." Nico Rosberg did not sound best pleased with Lewis Hamilton at the start of the race. When asked for his thoughts on the start, Hamilton said: “I don’t really feel it was that close. The inside line is the inside line, so it was my corner. McLaren team boss Ron Dennis wasn't best pleased by Fernando Alonso's complaints over team radio during the race - when he vented his frustration at racing with a "GP2 engine" and describing the car's performance as "very embarrassing". "It's not very constructive when you are trying to build a stronger relationship [with Honda management]," he said. "Do I condone it? No. Am I going to go ballistic? No. I will handle it in my own way and my way is not in public. "I can understand it - it's not just one race." More from McLaren team boss Ron Dennis as he says he wants to keep Jenson Button and Fernando Alonso in 2016. "Jenson is on a two-year contract and Fernando on a three-year contract. It's as simple as that," he says. "I told Jenson on Thursday - probably too late - that I have no intention of exercising the option [to cancel his contract]." Fascinating stuff from the McLaren pair, and there was an equally fascinating interview with McLaren boss Ron Dennis on BBC One just now. He says McLaren are going up a "very steep learning curve" and insists Jenson Button will stay at McLaren in 2016. "We have two drivers," he said. "We want both of them in the team and it is as simple as that. We will have a winning team." It is never good when you are lapped, never mind when you are a former world champion being lapped. Jenson Button finished 16th and he sounded just as frustrated as Fernando Alonso in his post-race interview. "We've got a lot of work to do," he said. "It is so tough for us because we are so used to fighting. Now it is not fighting it is like a Samurai warrior without his sword." "You're obviously frustrated when you are overtaken on the straights. In corners other cars are braking late and making mistakes and you are perfect in the corners. "On the positive side, we keep improving reliability and we didn't repeat the errors in Singapore." Alonso to stay? Or go? There has been some uncertainty over the future of Fernando Alonsoat McLaren, and he has just been asked by BBC Sport's Lee McKenzie if he will still be driving for the team next year. He replied: "Next year is what we are looking for. My intention is to stay for sure and we will win together, I'm sure." He was asked directly if he will be racing in F1 next year and replied: "I don't know." Fernando Alonso marked the 10th anniversary of his first world title by finishing 11th, but it was a day of frustration for the Spaniard, as he got into the points, but was unable to hold that position and vented a couple of times on team radio, calling it "embarrassing" after he was overtaken by a Sauber. Mercedes' team boss Toto Wolff speaking to BBC Sport: "Lewis had a better start and stuck his nose in. It was a tough corner for both of them. "It makes me particularly proud that we finished one-two (after Rosberg dropped to fourth) because we played two different strategies to get past Bottas and Vettel when we undercut them. "Slightly relived is an understatement. We had a lot of issues through the race." Lewis Hamilton reveals that he sang "Victory" in karaoke last night. It did the trick today. "That's the one I'll be playing tonight," he says on the podium. Third-placed Sebastian Vettel in the podium interviews: "It's my favourite race, I love the track and I love the fans. "Overall it was a fantastic race. The start was interesting - watching these two fighting in the first corner and I was able to take advantage of that. Unfortunately I wasn't able to get the big trophy today. "They are very difficult to beat." "Lewis got the better start"
Nico Rosberg, who finished second: "Lewis just got a better start, fair play. It was great to fight back to second because fourth would not have been acceptable. It is also great for us as a team to be back here after Singapore. "I had to win today, that didn't work out. Just have to try again next time." Race winner Lewis Hamilton in the podium interviews: "I'm so happy right now. The team has done a fantastic job all weekend. I had a great start. "For me to come here to a race where I used to watch Ayrton Senna drive, and match his career wins, it doesn't feel real at the moment. "It was important for us to strike back. We didn't bring our 'A' game in Singapore and we had to bring it today." National anthems sung, champagne sprayed. A standard post-race win scene but then there is a moment of awkwardness as the microphones don't work. A quick bash at the top of them seems to do the trick. Amy Brown: Yes! So happy. Well done, Lewis! Wendy Pankhurst: Sublime win for Lewis Hamilton - though you did forget he was racing. Also managed fastest lap too! Out come the three drivers onto the podium, Lewis Hamilton taking his place on the top step. A familiar position. Victory was his eighth of the season and increases his advantage over Nico Rosberg in the drivers' championship to 48 points. "This has been a much stronger performance from Nico Rosberg. He lost out to Hamilton into Turn Two but the aggression he showed to pass Bottas, he just needs to show that against Hamilton." Race winner Lewis Hamilton: "Fantastic job guys, you did a flawless job all weekend as always. It's great to be back up here." "Now Lewis Hamilton has matched Ayrton Senna's 41 career victories - it took him one race more than Senna." Back-to-back wins for Lewis Hamilton after he got the jump on Nico Rosberg at the start. A 41st win of his career, putting him level with Ayrton Senna. Nico Rosberg takes second place to cement a Mercedes one-two, with Sebastian Vettel third. Ah, Felipe Nasr has retired. Oh so close to a race without retirement. Engineer to Sauber's Marcus Ericsson (currently 14th): "Fight the Red Bulls, fight the Red Bulls." He has just been passed by Daniil Kvyat, wheel -to-wheel racing as the Red Bull squeezes past, and Ericsson has Daniel Ricciardo behind him. Five laps to go and it is all to easy for Lewis Hamilton, who is surely having a whale of a time today. He leads by 16s and will have barely had an easier race all season. A poor start has ultimately cost Nico Rosberg, and he needs to be mindful of Sebastian Vettel, who is 2.2s behind in third. Max Verstappen, who turns 18 in three days, started this race 17th. He is ninth now, picking off his team-mate Carlos Sainz at the chicane. This lad is born to race. Gulp. I almost, ALMOST spoke too soon there. Will Stevens spins at 130R but reacts superbly to catch it and recover, just avoiding a collision with his team-mate Alexander Rossi. Sergio Perez continues his pursuit of Marcus Ericsson in 12th. He tries to make his move on the outside at Turn 1 but Ericsson holds him off. Amazingly, there has not been a single retirement in this race with just 10 laps remaining. Force India's Sergio Perez (currently 13th): "Ericsson is moving under braking." Lewis Hamilton is sitting pretty out in front and is surely cruising to a second successive win at Suzuka. He leads Nico Rosberg by 12 seconds with 11 laps to go. It doesn't look like Rosberg is danger of troubling that advantage as well, with little between their latest laps. "Vettel is only 1.7 seconds behind Rosberg. Vettel has a big bunch of traffic in front of him as well - this is going to be interesting." James Matthews: Oh well, Honda. You tried, that’s the main thing. Sean Ranson: What's the point in paying all that money to the best driver in F1 & delivering such an awful car? Looks like Nando's realised it too! Martijn Kosters: Maldonado is in sixth and I haven't seen him at all! Sergio Perez, on fresh tyres, is the third fastest man on the track and he breezes past Jenson Button and into 13th. Sebastian Vettel is currently the fastest and pushing for second place. Nico Rosberg is less than two seconds down the road. Race control confirms Will Stevens is under investigation for speeding in the pits. The Brit, currently 18th, had just made his second stop of the race. Engineer to race leader Lewis Hamilton: "Okay, Lewis, everything appears to be under control. We just have to watch out for flat spots and look after this set." Lewis Hamilton puts down another fastest lap with a 1:36.145 as he continues to assert his dominance on this race. There's a huge lock-up for Romain Grosjean, who is eighth, at the chicane and the Lotus pits soon after. FF1s: Alonso is out-sassing Button this week on the radio. A possible concern for Lewis Hamilton as he reports "big vibrations". He subsequently heads in for his second stop, taking on fresh hard tyres and resumes with a 10.5s advantage over Nico Rosberg. Kimi Raikkonen pits, taking on another set of hard tyres and is back out in sixth, before Fernando Alonso and then Nico Rosberg pits from second. Scott MacDonald: Is Alonso engineering a move out of Mclaren with these public statements. Clare Star: At least @alo_oficial is keeping it light and fun. Fquiren: THAT, could be the moment that Alonso decides that enough is enough. What a pass! Carlos Sainz is making his second pit stop but makes a mistake on his way in, clipping a cone and damaging his front wing, leaving some debris on the circuit. He shouts to his engineers: "GP2 engine, GP2 engine." And finishes with a cry of anguish. Patience running out for the two-time world champion? Daniil Kvyat has a brief excursion off the track, costing him a few valuable seconds as he looks to try and recover his race after a difficult weekend so far. He is currently 16th. Matthias Carter: I love how Verstappen will always have a go. Great talent. This is not want Jenson Button wants to see as there is a Sauber looming large in his rear mirrors. Marcus Ericsson is pushing, eyeing the chance for a move on the McLaren. He's not found one so far, though. Meanwhile, Manor had kept their drivers out when everyone else had pitted, but Will Stevens and Alexander Rossi finally head in on lap 24 for their first stops, switching to the hard tyre. Engineer to Ferrari's Kimi Raikkonen: "This is good, Kimi. Keep going. Let's have him." Finn Raikkonen (fifth) is closing on compatriot Valtteri Bottas, running fourth. "It's easy to knock Pastor Maldonado but he's doing a really solid job this afternoon - let's hope he can keep it going." Maldonado is currently running ninth, with his Lotus team-mate Romain Grosjean just ahead. Lewis Hamilton is the fastest man on the track at the moment, putting down a 1:37:961, almost 1.5s faster than Sebastian Vettel latest lap. The gap between the two is now 11.3s. Ryan Blyhe: That's a great move by Rosberg without DRS on Bottas. Matthew Thomas: Why couldn't he pass him that easily 15 laps ago though? Josh Johnson: Nicely done @nico_rosberg ! Engineer to Mercedes' Nico Rosberg: "So push to attack Bottas to destroy his tyres." No need to do so as Rosberg almost immediately gets past the Finn! Fantastic stuff as Rosberg goes for it at the chicane and sweeps into third. Nico Rosberg is back out on hard tyres. Lewis Hamilton responds by making his first stop but stays on medium tyres. Hamilton returns in the lead with an advantage of 6.7s over Sebastian Vettel. Kimi Raikkonen is called in one lap after Sebastian Vettel and he switches to hard tyres. Back out in fifth. Soon after, Nico Rosberg is also told to box for the first Mercedes stop of the race. Daniil Kvyat looks to be in a bit of trouble. He is told to make some "urgent" changes to his settings, but he worriedly relays over the radio that it doesn't work. He is currently 12th. "Jenson Button started the race on hard tyres and has given it up after 11 laps, which is incredibly short. Pirelli's projected life for the hard tyres was 25 laps." Sebastian Vettel switches to the hard tyre and is out in fifth, with Carlos Sainz ahead of him. The pit stops have elevated Nico Rosberg up to second. Only the two Mercedes, Kimi Raikkonen, Sainz and the two Manors to make their first stops. Valtteri Bottas pits from third and stays on mediums. He is back out in seventh. Romain Grosjean does likewise from sixth. Meanwhile, Lewis Hamilton is heading off further into the distance up front, the gap is now 7.4 seconds over Sebastian Vettel, who is heading in for his first stop on lap 14. Marcus Ericsson spins at Spoon from ninth before several drivers decide to head into the pits. Jenson Button, Nico Hulkenberg and Felipe Nasr among them. Dan Phelps: How demotivating must it be for @JensonButton with the awful pace of the @McLarenF1 Will this make his mind up for next year? Matthew Restaino: Using DRS against the McLarens is just cheating surely? Mohsin: It's sad to see McLaren struggle so bad. Matthias Carter: Even though I've been a Button fan since his debut, I really want him to retire and go to WEC. That Honda's embarrassing. Daniil Kvyat pits to take on hard tyres and is back out in 18th. Meanwhile, Daniel Ricciardo is 19th after that early puncture, but only the top four are faster than him on the circuit at the moment. How's things looking for Nico Rosberg? Not great. He is still fourth after a poor start, but Kimi Raikkonen is creeping up behind him. The Ferrari is 1.4s behind. There's more bad news as Rosberg is told over team radio by his engineer: "Nico, engine temps are high, causing damage." Not something the Honda fans want to see as Fernando Alonso's McLaren is picked off by the Sauber of Marcus Ericsson. ""Embarrassing. Very embarrassing," Alonso says. Ryan Blythe: Can't blame Riccardo for that. Massa had a shocker of a start & D Ric got squeezed between Felipe & Raikkonen. Edward Williamson: I think Massa has passed his worth on the grid. Elliot Cornish: One-team dominance only works in F1 when both drivers are evenly matched. Rosberg hasn't held a candle to Hamilton this season. Max Verstappen loves an overtake and he is steadily progressing through the field. He started 17th and is already up to 13th. Lewis Hamilton is casually told over team radio to build up a 10 second lead at the front. His advantage is quickly building as he now leads by 3.5s, having just set the fastest lap with a 1:39.140. Mercedes' Nico Rosberg (currently fourth): "Can I turn up the engine again?" Engineer: "That's fine, Nico. When you can, go to strap three." Good start from the Lotus pair with both Romain Grosjean and Pastor Maldonado gaining places. Grosjean is up to sixth from eighth, while Maldonado has climbed into the top 10, up to seventh from 11th. Dazzla: GET IN THERE HAMILTON, got the inside and hung Rosberg out to dry, brilliant start!! Laura: Car off. Automatically assume it's Maldonado. Adam: Punctures left right and centre at the start of this race. Three laps down and Lewis Hamilton leads Sebastian Vettel - who also made a great start - by two seconds. Valtteri Bottas is third with Nico Rosberg fourth. "The pain is growing inside Rosberg as he goes across the line in fourth place. Whenever he goes into wheel-to-wheel combat with Hamilton, he always seems to come off second best." Daniel Ricciardo is not the only driver to suffer an early puncture, also Felipe Massa and Sergio Perez, who went through the gravel in an eventful start. Massa is very slow as he limps back to the pits and the yellow flags are waved. Red Bull's Daniel Ricciardo: "I have a puncture." "That was incredible - it looked like Hamilton was starting lose the position to Rosberg as he tried to go around the outside." Great start by Lewis Hamilton and he is into the lead at the first corner. Nico Rosberg, meanwhile is dropping back. He looked to have almost kept Hamilton at bay but is now down to fourth. Can Felipe Massa get the jump on Sebastian Vetel at the first corner? The Brazilian starts from fifth. Rebecca Odedun: Reminiscing about how #Suzuka used to signify the end of the year instead of multiple soulless Ecclestone commisioned circuits. Clare Star: Seems like a long time since my last early #bbcf1 start. Coffee, nan blanket, cat. Looks like we are good to go! Off goes the grid for the formation lap and everyone looks to have got off OK.
Just Jenson Button on the hard tyre, everyone else on the medium compound. It is the same front row as the 2014 race. Back then, Lewis Hamilton managed to get past Nico Rosberg to take victory. That was in the wet, though. very much dry conditions today. Kyle Mclaren: I hope Vettel can win today anything can happen after all this is racing #bbcf1 fingers crossed for him. CK Chandu: Breakfast served with #JapaneseGP All set to end the weekend! Vinny Anthony: Looking forward to this. Hoping for the ideal start come on @LewisHamilton! He's not won from lower than third, though. He starts today's race from fourth. “Strategy-wise, this is likely to be a two-stop race - one-stop is fine on wear but may be an issue with degradation. Three stops makes you too vulnerable to traffic on a track where overtaking is difficult - and is slower anyway. So that leaves two stops. Daniel Ricciardo said the race was ‘unpredictable’. Austria's Gerhard Berger, who won the first F1 Japanese Grand Prix in 1987, tells BBC Sport's David Coulthard: "Everything is back to normal here. If they have a good start and no technical issues, I think we will see Mercedes going away." The Sunday Times say 'normal service was resumed at Suzuka' with Mercedes locking out the front row, Nico Rosberg on pole ahead of championship leader Lewis Hamilton as their 'mysterious loss of form in Singapore a week ago was all but forgotten'. Red Bull's Daniel Ricciardo, starting seventh, talks to BBC Sport's David Coulthard on the grid while he receives a head and neck massage. Is he feeling relaxed and loose and ready to overtake the cars in front? He said: "We don't have enough speed in the straights. Turn 11 is always a good spot - maybe in the corner if I am close enough. We will have to use strategy." The fans are in fine form once again for today's race. "Watch out for Williams at the start - these guys have been making good starts and Mercedes are nervous." Williams' Valtteri Bottas, starting third, speaking to BBC Sport's David Coulthard: "I am feeling quite confident for the start. I have been having some good starts lately and Mercedes have been having some issues." Just woke up? Don't forget you can watch this race live on BBC One now, with David Coulthard running around the grid in the pursuit of interviews. What the papers say - Alonso to retire? The Mail on Sunday say that McLaren's Jenson Button is 'rethinking' reported retirement plans as a result of team-mate Fernando Alonso considering his future in the sport. Should Alonso walk away, they say, it would leave McLaren 'in the most precarious situation - without one, or possibly, two of their star drivers'. “Discussions aimed at securing Red Bull and Toro Rosso a Ferrari engine supply for next year continue, with no solution yet. Insiders say that the Ferrari race team want to give Red Bull year-old engines, which is allowed in the rules but which is unacceptable to Red Bull. The Japanese fans at Suzuka love to give gifts to the drivers and here is one of the more creative efforts. A Star Wars poster with a Mercedes twist. Top work. "Mercedes have not given us a clear description of what went wrong in Singapore. Aerodynamics are so complex, occasionally you fall out of the window." Mercedes' Lewis Hamilton, starting second, tells BBC Sport's Lee McKenzie on how he got over his retirement from the Singapore GP: "I forgot about it as soon as I got home and went to bed. I have so much confidence in our guys, I know they will do everything they can to make sure it doesn't happen again." Sebastian Vettel has won more Japanese GPs (four) than any other current driver, while Ferrari are the most successful team with nine wins. A very cute McLaren-Honda fan... and even younger than Max Verstappen! Interesting comparison from the Mercedes team, who say the characteristics of Suzuka are the closest to British Grand Prix venue Silverstone on the F1 calendar. “It may not surprise you to hear that there is a potential issue with tyres in this race. Concerned to prevent a repeat of the the explosions of Spa, Pirelli has mandated higher tyre pressures for this weekend, to bolster the tyre’s strength and take the strain off what appears to be a construction with a weakness that can be tested by high cornering loads. Minimum rear tyre pressures are 3.5psi higher than they were at this race last year and the effect has been overheating tyres. Jules Bianchi will be in the minds of every driver at Suzuka today, with Formula 1 back at the circuit for the first time since the French driver's fatal crash last year. As for the man himself, Daniil Kvyat tells BBC Sport's Lee McKenzie "I am completely fine" as he prepares to start from the pit-lane. Team-mate Daniel Ricciardo starts seventh and Christian Horner says the Australian has been "awesome around here all weekend" as he is expecting the Red Bulls to be "stronger than we qualified". "The first we knew about it was the telemetry because the TV cameras hadn't picked it up - the radio came on and we heard heavy breathing and then an expletive." Horner adds that the Red Bull mechanics "turned up the music and 12 hours later they completely rebuilt the car." How closer could it be between Nico Rosberg and Lewis Hamilton today? There's not been much between the two throughout this weekend, so even the tiniest mistake could prove decisive. Fernando Alonso all but sealed the 2006 world title by winning the Japanese Grand Prix after Michael Schumacher retired. Lotus's Romain Grosjean starts eighth after another excellent qualifying performance. "Suzuka is like a high-speed rollercoaster - not only that feeling of your belly moving around but also you're pulling massive lateral g-forces." “Less than an hour after his monumental accident, in which he rolled his Red Bull, Daniil Kvyat was having lunch with his engineers and laughing about it, miming what happened with his hands. There was late drama in qualifying yesterday as Daniil Kvyat was involved in a massive crash, which you can see here. The Red Bull driver was, thankfully, fine, but his car not so much. After the chassis was rebuilt and engine changed, Kvyat starts from the pit lane today. Could Hamilton have got pole? “Lewis Hamilton was asked how much he was ahead of Nico Rosberg on the final qualifying lap he had to abort because of Daniil Kvyat’s accident, but he wasn’t saying. Michael Schumacher is the most successful driver at the Japanese Grand Prix with six wins. Here he is claiming one of those at the 1997 race at Suzuka. The Japanese fans at Suzuka have been brilliant this weekend, taking the whole getting dressed up for the occasion to a new level. Check out some of the best costumes and car hats in our feature on the Suzuka fans here. Hands up then who is completing the set of early morning F1 watching today? On that subject, what is your earliest memory of getting up to follow a Japanese Grand Prix? Ever got up at unsociable hours to follow lap-by-lap updates in the old days of Ceefax? Let us know your earliest memory of following the Japanese GP and when and how you followed it via #bbcf1, text in on 81111 (UK only) or post your comment on the BBC Sport Facebook page. OK, arm yourself with a massive cup of coffee and settle in for some early morning F1 action. The race starts at 06:00 BST and build-up will be hitting your television screens at 05:00 on BBC One, with commentary on 5 live from 05:30. You can also watch and listen online too. “After the surreal circumstances of the Singapore Grand Prix, it has been back to business as usual in Japan, with the two Mercedes on the front row and looking comfortably clear of the field. It seems inconceivable that one of them will not win, but the race is unpredictable. "On pace, pole should have been Lewis Hamilton’s, but he made a couple of mistakes on his first lap in the top 10 shoot-out and Daniil Kvyat’s huge accident at the end of qualifying but paid to what the world champion said was on course to be ‘perhaps the best lap I've ever done here’. After a slip-up in Singapore, Mercedes have been back to their dominant best so far in Japan, and few would bet against one of their drivers taking victory today. But which driver will it be? 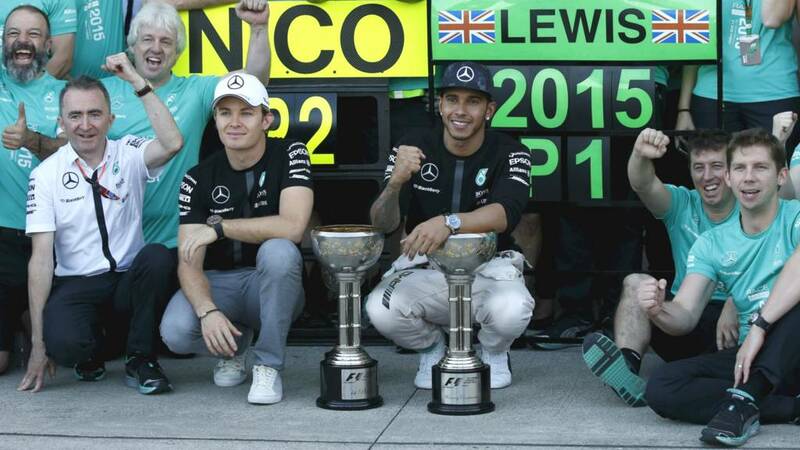 Nico Rosberg will be desperate to reduce the gap between himself and Lewis Hamilton. The championship leader will be determined to keep his title at arms length. Suzuka. So often the scene of a world championship decider.